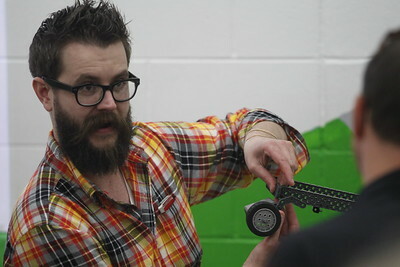 Matthew Apgar - mapgar@shawmedia.com Teachers Brent Mullane and Lauren Lesak work on creating a miniature motorized vehicle before competing in an obstacle course as professional development for Teacher Institute Day on Friday, April 17, 2015 at Martin Elementary School in Lake In The Hills. Students had the day off for teachers to work on the project. 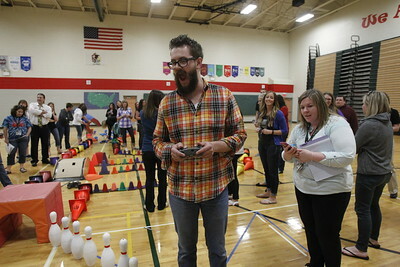 Matthew Apgar - mapgar@shawmedia.com Teachers race the clock to build miniature motorized vehicles to compete in an obstacle course as professional development for Teacher Institute Day on Friday, April 17, 2015 at Martin Elementary School in Lake In The Hills. Matthew Apgar - mapgar@shawmedia.com Teachers (from left:) Denise Soling, Katie Burley, Ingrid Mullane, Katie Galgay, and Paula Gerke work on building a miniature motorized vehicles to compete in an obstacle course as professional development for Teacher Institute Day on Friday, April 17, 2015 at Martin Elementary School in Lake In The Hills. Students had the day off as teachers worked on the robotics project. Matthew Apgar - mapgar@shawmedia.com Brent Mullane is handed vehicle parts from Lauren Lesak, left, and a flower, right, as they make adjustments to their miniature motorized vehicle before competing in an obstacle course as professional development for Teacher Institute Day on Friday, April 17, 2015 at Martin Elementary School in Lake In The Hills. Students had the day off for teachers to work on the project. 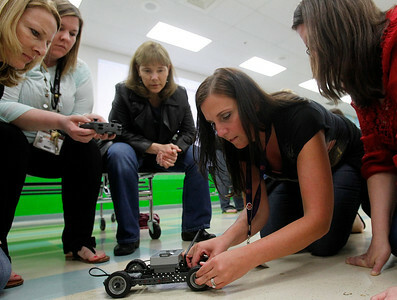 Matthew Apgar - mapgar@shawmedia.com Teachers Elizabeth Vosburgh, left, and Julie Girmscheid take a look at their miniature motorized robotic vehicles as they and other teachers compete in an obstacle course as professional development for Teacher Institute Day on Friday, April 17, 2015 at Martin Elementary School in Lake In The Hills. Teachers were given a box of parts and instructed to build a vehicle from those parts to race in an obstacle course in the gym. 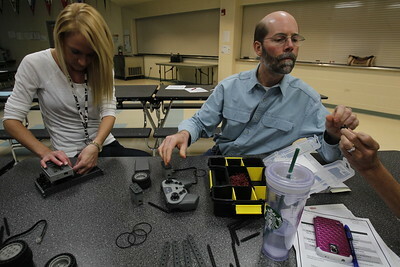 Teachers Brent Mullane and Lauren Lesak work on creating a miniature motorized vehicle before competing in an obstacle course as professional development for Teacher Institute Day on Friday, April 17, 2015 at Martin Elementary School in Lake In The Hills. Students had the day off for teachers to work on the project.